It’s not Ryan Lochte or even Lauren Conrad who’s been turning the most heads this New York Fashion Week. The sartorially-blessed mother and daughter duo, celeb stylist June Ambrose and seven-year-old daughter Summer Chamblain, have been everywhere this season. It's been hard to miss the fabulously styled twosome; the grade schooler alone has a headwear collection to rival Anna Dello Russo’s. We caught a second with June and Summer before the hot mess of a Custo Barcelona show for a majorly heartwarming and fashion frenzy palate-cleansing moment. It’s not Ryan Lochte or even Lauren Conrad who’s been turning the most heads this New York Fashion Week. The sartorially-blessed mother and daughter duo, celeb stylist June Ambrose and seven-year-old daughter Summer Chamblin, have been everywhere this season. It&apos;s been hard to miss the fabulously styled twosome; the grade schooler alone has a headwear collection to rival Anna Dello Russo’s. We caught a second with June and Summer before the hot mess of a Custo Barcelona show for a majorly heartwarming and fashion frenzy palate-cleansing moment. And lucky we did because the pint-sized fashion vet was about to head to Y-3 with her mom. Hey, is it normal to be jealous of a seven-year-old? Fashionista: So what has Fashion Week been like as a mother-daughter bonding experience? June: It’s been great. [Summer] starts school tomorrow so this is how we end the summer every year. And it’s great because she gets to do things with me and experience some things that I love and have an appreciation for things that excite me: art and culture. What’s your getting ready ritual like? Summer likes to play in my closet, so she gets to pick out accessories. Like today, she’s wearing my Sonia Rykiel bag and Hermes bracelets. So she has fun. Hey, Summer, what’s your favorite runway show been so far? Summer: Mom--wait, wait, mom, mom, moooommy, what was the show we saw before this? (June: “Tracy Reese”). Tracy Reese. Who’s your favorite celebrity that you’ve seen at the shows so far? Um...(thinks for a moment and says confidently with a smile) My mom. AWWWWWWWW. Click through to see all of her fabulous looks that she&apos;s been rocking front row this week. 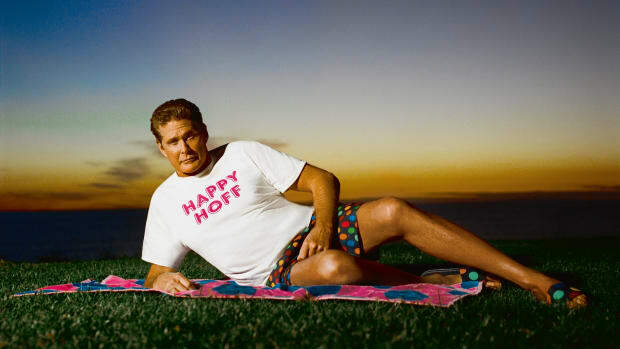 "Pretty soon I'm going to have my own underwear with my own Hoff face." Watch out, Choupette. There's a new girl in town.